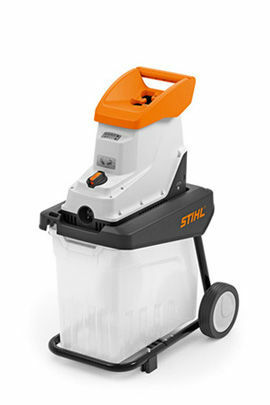 Stihl has released a new chipper/ shredder with a product suitable for every application. The entry level chipper is the GE 135 L electric shredder aimed at the individual was a small backyard or even a smaller unit. It can mulch a maximum diameter of 35mm shredding the branch material in the 60 litre waste bucket below for easy disposal. Where these chippers are separated in quality is the blade system. Chipping branches is easy, its the greener, softer waste which cheaper shredders struggle with. This model is more for branches, if you have a lot of green waster and leaves then you are better off looking at the higher end Stihl shredders. Usually smaller chippers/shredders are not capable of much but this little GE 135 L can easily cut up branches of 35mm. An electric motor means no fuel, no oil, no engine servicing, no emissions and no loud petrol engine noises. The generous waste bucket keeps all the debris and clippings in a nice confined area for you to dispose of into the waste bin or the garden easily.